Leaders of South Africa’s governing ANC party are meeting to decide the future of President Jacob Zuma. The National Executive Committee (NEC) is likely to ask him to step down, says BBC Africa correspondent Andrew Harding. ANC president Cyril Ramaphosa acknowledged on Sunday that the issue was causing “disunity and discord”. Mr Zuma, 75, faces a number of corruption charges after nine years in power. There are 112 members of the NEC, and many may want to share their views during the meeting in Pretoria – meaning it they may not finish until late on Monday. What did Mr Ramaphosa say? 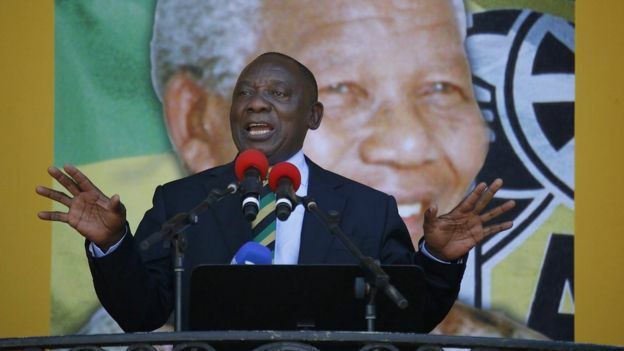 “We know you want closure,” Mr Ramaphosa told a crowd, which had gathered to mark 100 years since the birth of the country’s first black president, Nelson Mandela. He told the crowd in Cape Town on Sunday that “our people want this matter to be finalised” and that the African National Congress (ANC) would comply. He acknowledged the ANC was suffering “a period of difficulty, disunity and discord”, and said he wanted to replace it with “a new beginning”. He pledged to tackle the corruption that has marred Mr Zuma’s time in office. Mr Ramaphosa urged South Africans to restore the values that Mr Mandela – also known as Madiba – stood for, and said those who had stolen state assets would be brought to justice. “We must work together as Madiba taught us to push back the frontiers of poverty, unemployment and inequality,” he said. Mr Zuma has resisted increasing pressure to quit since December, when Mr Ramaphosa replaced him as leader of the ANC. Mr Zuma’s presidency has been overshadowed by allegations of corruption. Why hasn’t the ANC sacked him before? Mr Ramaphosa may want to make sure Mr Zuma’s supporters do not feel he has been treated badly – especially as an election is coming up next year. However, he would then be expected to face a confidence vote in parliament. The date for this has already been set – 22 February. 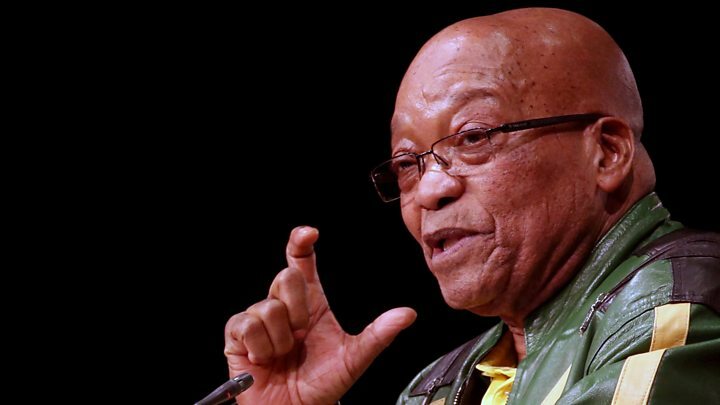 South African media is calling President Zuma’s seemingly inevitable exit “Zexit”. South Africa’s previous president, Thabo Mbeki, resigned in 2008. He also had a power struggle with his deputy.